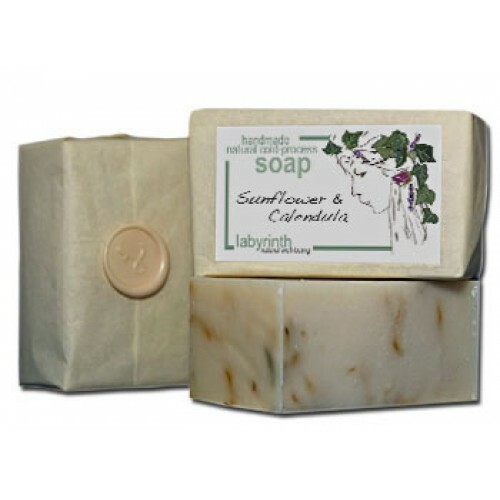 The healing properties of Sunflower and Calendula provide an antiseptic action which can help the relief of skin infections such as acne and athletes foot, while Calendula's anti-inflammatory properties can aid sufferers of eczema. Vitamin E found in Sunflower can also help fight the signs of ageing. 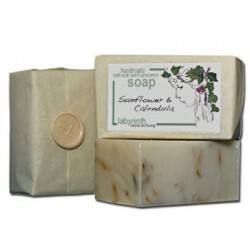 Good for all skin types, particularly useful for dry skin. Olive Oil (Sodium olivate), Coconut Oil (Sodium cocoate), Regulated Palm Oil (Elaeis guineensis), Spring Water (Aqua), Sunflower Oil (Sodium helianthus annuus), Calendula (Prunus amygdalus dulcis), Clary Sage (Salvia sclarea), Marjoram (Thymus mastichina), Marigold Petals (Calendula officinalis). Naturally Occuring: Linalool, Geraniol, Limonene.